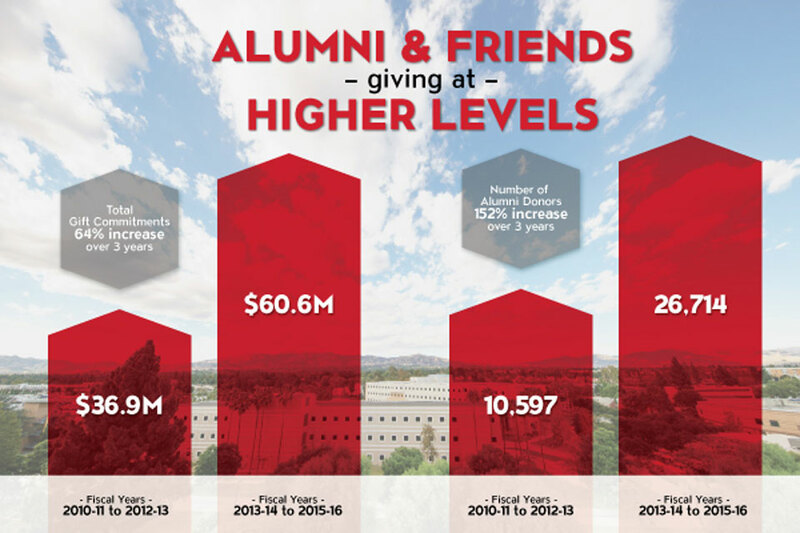 Alumni and supporters of California State University, Northridge set a new standard for giving in 2015-2016. For the third year in a row, nearly $20 million in gift commitments have been made to CSUN, putting the three-year total at $60.5 million, compared to $36.9 million from the prior three-year period — a 64 percent increase. The total last year was $19.6 million. The number of alumni donors supporting their alma mater also rose to new heights, reaching 11,262. This is the third year in a row that there has been a record in total number of donors and alumni donors. There were numerous special stories of giving from throughout the fiscal year. For example, CSUN nutrition professor Terri Lisagor and her husband, Mark, arranged a planned gift to CSUN that will ultimately leave $1 million to establish an endowed scholarship for students in the Resilient Scholars Program, which serves students who were formerly in the foster youth system, and another endowment that will support faculty research, travel, and professional development in the Department of Family and Consumer Sciences. Alumnus Irv Zakheim ’71 (Physical Education), chairman and CEO of Zak Designs, donated $1.5 million to Matador Baseball as a lead gift to fund renovations and new construction for the program. The gift will help fund a renovated entryway to the stadium, the first of multiple projects that will modernize a complex that is more than 50 years old. The Hollywood Foreign Press Association (HFPA) awarded CSUN $2 million to support students and enhance technology in the school’s acclaimed Department of Cinema and Television Arts, which is ranked in the top 25 nationally by The Hollywood Reporter and top 40 globally by Variety. A portion of the grant will go toward creating endowed scholarships to support underrepresented film and television students in the industry. Scholarship recipients will be named Hollywood Foreign Press Association Scholars and be mentored by department faculty and industry professionals. Chair of the CSUN Foundation Board Earl Enzer ’83 (Finance) has helped lead CSUN’s philanthropic growth alongside a group of leading alumni and community volunteers. Starting with his days as a student, through his success in business to helping his alma mater today, Enzer has seen how CSUN’s standing in the region continues to grow and positions it to impact lives for many years to come. That momentum has already started. At the David Nazarian College of Business and Economics’ 50th Anniversary Gala on Sept. 22, accounting industry leader Harvey Bookstein ’70 (Business Administration) and his wife Harriet, both CSUN alumni and lifelong supporters of the university, announced a $5 million gift. “Every time you get near the students of CSUN and see how their eyes light up from the education they are getting, I don’t see how you couldn’t do something for the university,” Harvey Bookstein said. To make your impact with a gift today go to: www.csun.edu/giving.